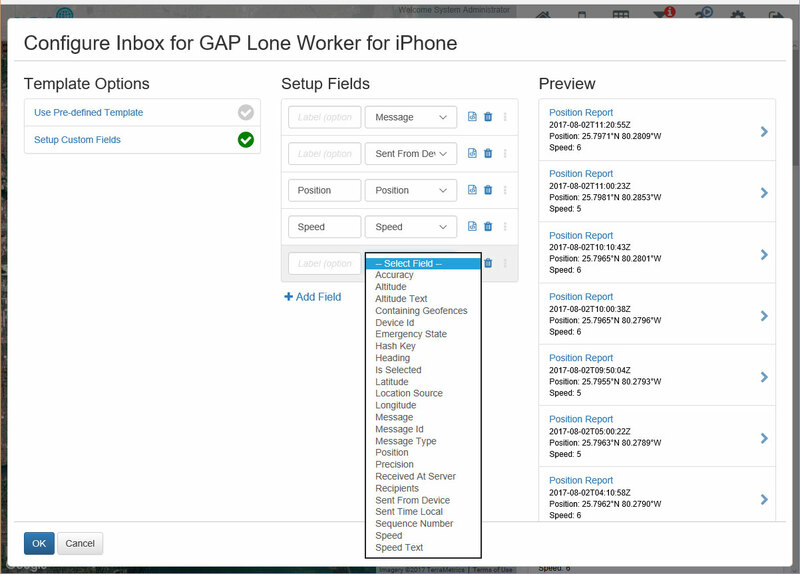 Each device on GAP has an Inbox, Outbox and Device Log. 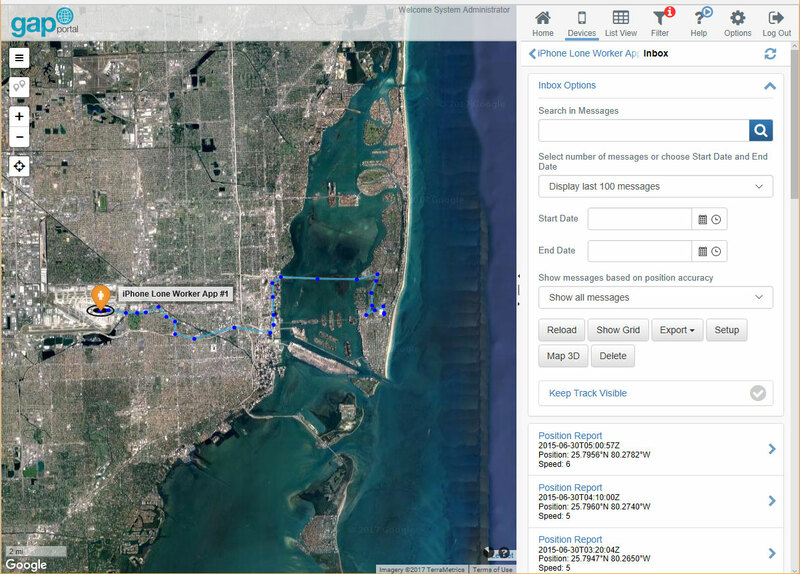 The Inbox displays messages that the device has sent to GAP. These are sometimes known as mobile originated (MO) messages. The Inbox will periodically refresh according to the interval defined in the "Portal Settings" screen under "My Profile". You can search for specific messages using the "Search in Messages" text box. To search, press Enter or click on the search icon. You can filter the Inbox using the date pickers or "Display last..." drop-down list. When ready, click "Reload" to apply the filter. To display messages in a tabular view, click "Show Grid". To export Inbox data to a file, click the "Export" button and select the desired format. Any filters you have applied will also be applied to the exported data. Click the "Map 3D" button. Please note, this function requires a supported browser and graphics adapter. Click the "Delete" button and check the messages you wish to delete. Then, click the "Yes, Delete". You can change how messages in the Inbox are displayed on a per-device basis. Any changes apply to your user account only. In the "Setup Fields" section, add the fields you wish to display. You can add more fields by clicking the "Add Field" link. A preview will be displayed in the "Preview" section. The Outbox displays messages that GAP has sent to the device. These are sometimes known as mobile terminated (MT) messages. You can filter the Outbox using the date pickers. Simply enter the desired dates in the "Start Date" and "End Date" boxes and click the "Reload Messages" button. To export Outbox data to a file, click the "Export" button. You can filter the Device Log using the date pickers. Simply enter the desired dates in the "Start Date" and "End Date" boxes and click the "Reload Messages" button. To export Device Log data to a file, click the "Export" button. Simply click "Add Note to Device Log" and enter the note in the "Note Text" text box, then click "Add Note".